During the Ryūkyū Kingdom, Tomari was a port city involved with the foreign trade of the Shuri court. It was the entrance for foreign visitors and the culture they brought. Along the way, the area became the birthplace of many experts in the fields of Chinese classics, performing arts, music, martial arts among others. It is said that Tomari’s temple Seigenji, commonly known as Ameku’s temple, was the base of activities of foreigners who disembarked in Tomari port. Among these were drifted ashore Chinese and Korean merchants. Tomari people were instructed in martial arts by these foreigners, which later gave birth to Tomarite, a martial art differing from the martial arts of Shuri and Naha. Tomarite is said to have started with Teruya Kishin (1804-1864) and Uku Karyū (1800-1850). The one who inherited their art was Matsumora Kōsaku (1829-1898). He is considered as the one who rejuvenated Tomarite. 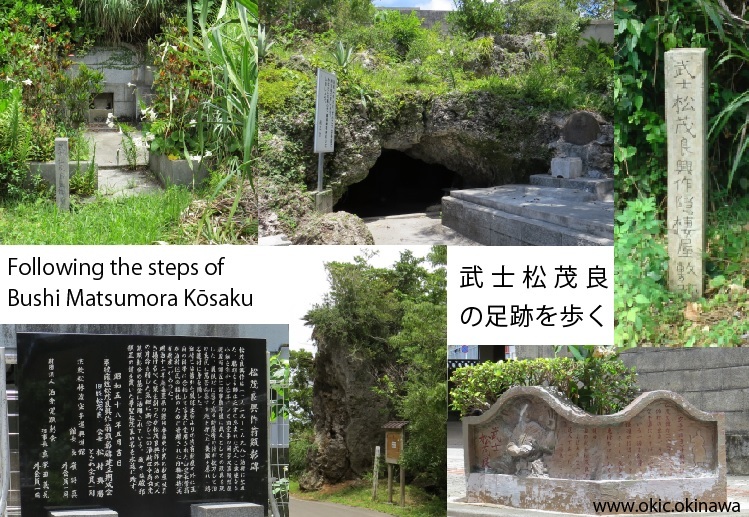 Today, there are at least 6 sites in the Okinawa prefecture that are landmarks in regard to the Tomari master’s legacy. The most famous is indeed the praising monument located in the Shinyashiki Park. Raised in May 1983, it is located between Route 58 and the Tomari international cemetery. Close-by, near the Tomari temple of Seigenji is the Kāmi-nu-yā cave where Matsumora Kōsaku is said to have train with a man who lived there. A passage about this cave can be found in the 1970 published book “Karate (Tomarite) Chukō no So, Matsumora Kōsaku Ryakuden” (1) by Matsumura Kōshō. Previously named Matsumora, the author is the grandchild of Matsumora Kōsaku. The third monument in Naha is located close by the Tomari elementary school and is known as the Bushi Matsumora relief sculpture. Next to these three monuments and sites, there are 3 other sites that relates to the master. One of them is the Fērē rock in Onna Village where Matsumora subdued some bandits. A second one mentioned on the monument raised in Shinyashiki Park and in Matsumura’s book is the master’s retreat in northern Okinawa. Finally, Matsumora’s tomb is located in Onna Village. Mainly remembered as a martial expert, Matsumora Kōsaku actually personifies a true Okinawan Bushi, meaning that next to having acquired great martial skills, he also contributed to the society. An example of his contribution is inscribed on the monument as follow. “In the past in Tomari Village, in addition to community property received from the Ryūkyū royal administration, existed a common property called ‘Nēwagumuchi’. It was donated for the welfare of Tomari villagers by Yamazato Chōken, who passed the royal government examination and became a government official (2). (1) The title could be translated as “Short biography of the rejuvenator of Tomarite Karate, Matsumora Kōsaku”. (2) Born in a poor family, Yamazato Chōken (1820-1893) raised to become a royal clerk. It is said that after passing the royal examination, he gave a huge sum of money to Tomari that was to be used for the education of local nobles.